In between dressing up in costumes, carving pumpkins and eating all the candy you can fit in your trick-or-treat bag, you also have parties to attend and scary movies to watch. Let’s add a new tradition this Halloween— decorating Haunted Gingerbread Houses. Why wait for the busy Christmas holiday season to build an amazing gingerbread house? It’s a spooktacular time of year, so grab your little ghouls for a new tradition without having to leave your kitchen. 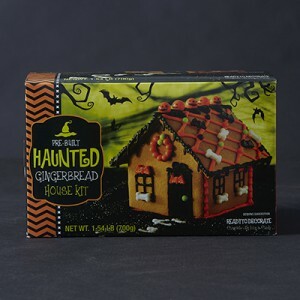 With our ready-to-decorate Haunted Gingerbread Kit, your spooky squad can easily construct the ghostliest house on the block. This kit provides black and orange icing and Halloween-shaped candies including pumpkins, bones and bats. You can add to the haunted house with some of your candy favorites. We had some fun decorating these houses and adding our own little twist. Which one will you try? Cracked walls and goopy icing is okay with haunted gingerbread houses. It adds to the spookiness. If you decide to use your gingerbread house as a party centerpiece, add some dry ice fog to the table for the perfect theme. 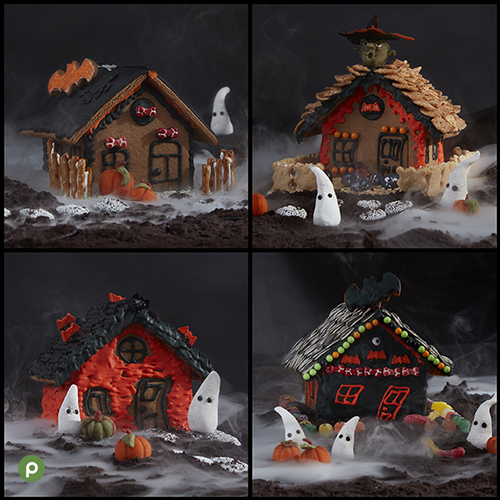 Expand your creation and make a cemetery around your gingerbread house with other spooky foods. Use cereal to add texture to the roof. Pretzel sticks and icing make a great fence! Gummy worms and gum drops add color and just the right amount of spook. 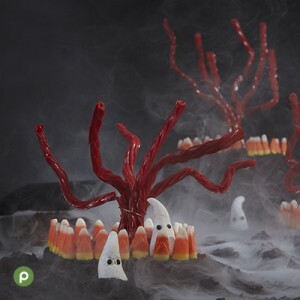 To build your own ghosts and pumpkins, try using marzipan to mold the extra touches. The best part about Halloween Haunted Gingerbread houses is that your house doesn’t have to be pretty. Remember you want your house to be scary and haunted, so don’t worry if the icing and candy isn’t perfectly placed. Any gingerbread house can be haunted if you give it the right touch. Does the roof have a crack? Perfect. Are the windows uneven? Even better. Snip off the closed end of the licorice. Push heavy wire gauge through the holes of each piece. Holding the pieces together in the middle, bend the ends to form a tree trunk. Wrap your wire around the center to hold the tree together. Place on iced graham cracker and add a candy corn fence. If you are in the mood to bake some gingerbread men for Halloween, try making these skeletons. What are your favorite Halloween traditions? Share them in the comments below. Monique B. began her journey at Publix in 2010, where she fell in love with the fact that, as an associate, she was also part owner of the company. Since then, she has dedicated her skills in organization and creativity to Publix, taking a special interest in social media. At the end of the day, she hopes The Publix Checkout leaves you with the knowledge that Publix is more than just a grocery store – we’re experts, we’re family, and we’re here to help!